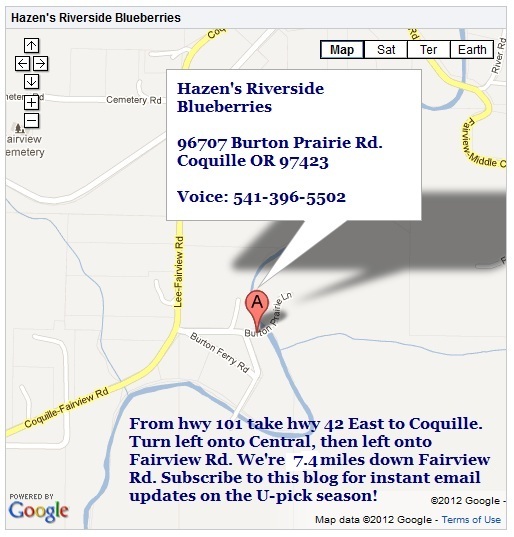 Hazen's Riverside Blueberries Coquille Oregon | Oregon's Finest U-Pick Blueberries fresh from the farm! Welcome to Hazen’s Riverside Blueberry Farm! Thank you all for a great 2018 blueberry season. We look forward to seeing you in 2019 sometime around the end of June to the first of July. Be sure to subscribe to this blog for email updates for the 2019 U-Pick Season. Each year we open our farm to the public to offer acres of fresh farm grown blueberries, U-Pick and pre-picked too. Marion berries and raspberries are offered based on seasonal availability each year, so check this blog each summer to see if pre-picked raspberries and marion berries will be offered. U-picking is a fun, kid-friendly family activity! You won’t find a better, more relaxing way to unwind and take in the fresh air and sunshine. If you have family or friends who have never been out here to pick fresh berries, be sure to forward one of our emails to them so they can find us online and subscribe too. We look forward to seeing all of you again this year! Our famous farm fresh U-Pick blueberries are spectacular in size, flavor and texture. They’re the best blueberries anywhere in southern Oregon at the very best price! Photo-gallery: Picking Fat Luscious Fresh Blueberries Out at Hazen’s! reasonably priced in the South Coast Oregon region. Hazen’s Riverside Blueberry Farm is located on 48 acres of pristine river bottom land near the quiet country community of Coquille Oregon. 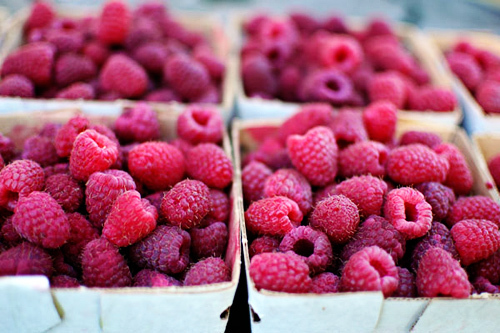 This year we will offer pre-picked fresh raspberries for the very first time. We are really excited about our new raspberry patch. It’s brand new! We offer U-Pick blueberries every summer from early July until about mid August, depending on picking volume, weather and field conditions. Be sure to subscribe to this blog for free updates and seasonal blueberry specials. Blueberries are one of the top ten super foods, rich in powerful antioxidants and minerals, delicious and edible in dozens of culinary forms. A favorite of the whole family, our farm grown blueberries add the finishing touch to the dinner or breakfast table in blueberry jellies, jams, pies, pancakes, flapjacks, cheesecake, scones, muffins, cobblers and other delightful recipes. Our Oregon farm grown U-Pick blueberries are cultivated by hand annually from mature bushes which are painstakingly pruned in late winter to produce a large, deep blue, luscious berry, which is rich in nutrition and bursting with flavor. Loyal customers who come to pick berries once inevitably return year after year. Subscribe to this blog [ see top right hand column ] for free instant email updates on when the berry season will be starting this year, price specials, u-pick specials, free recipes, opening dates, hours and availability. Use any of the online map programs for directions, entering this address: 96707 Burton Prairie Lane 97423. We’re in Fairview, Oregon, west of Coquille, the Coos County seat. We’re also listed on the Oregon Grown Blueberries website. PLEASE NOTE! Our berries are very popular, and once in a while we get picked clean! We recommend that U-Pickers show up frequently during the first weeks of any blueberry season to be sure to get all the berries you want. Each year we get more popular, and each year we get picked out a little bit sooner. But not to worry! We will be putting in several hundred new shrubs this winter. More on that soon! Make sure you subscribe to this blog for free seasonal updates, delicious blueberry recipes, fun blueberry trivia, and then check your email for updates on berry availability during the picking season. We will look forward to meeting you and your whole family! 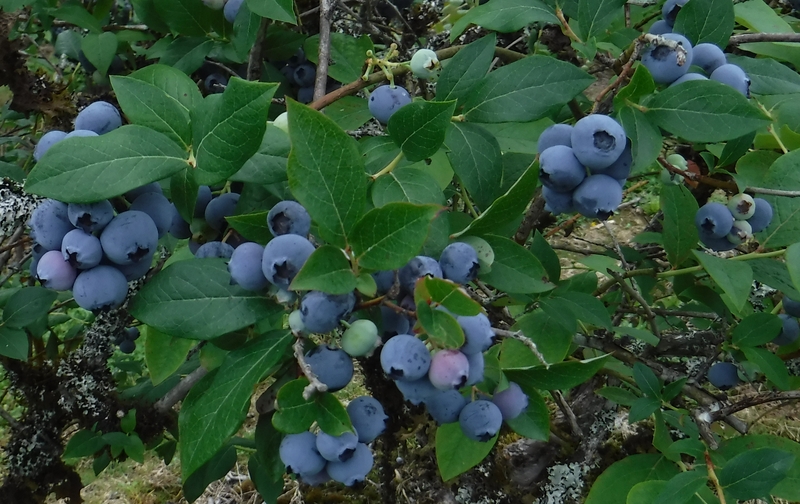 You’ll enjoy coming out to buy or pick your own delicious sun ripened blueberries, grown in the Fairview mountain valley of the South Coast town of Coquille Oregon. Bring the kids too! They love to pick blueberries. Be sure to read our FAQs before you come out to pick for the first time. We will look forward to meeting you! All blog contents are Copyright Hazen’s Riverside Blueberry Farm 2017, All Rights Reserved. International Copyright Secured in Perpetuity. Stumbled upon your farm last year while camping. Really looking forward to picking again this year! We all enjoyed picking this year and will look forward to 2013 for more good memories. We are still enjoying your blueberries in the pie filling I made last year. The raspberries sound great! Ah, the joys of summer! We look forward to coming out and picking every year as part of our summer experience!!! The sweet flavor we can carry with us through the year!!! You better get on up here lady and pick some berries SOON then stop by our place for a visit too. We miss you! Hope you like the berry blog I built for Wendy and Wally! Call us sometime. Hope you and Viv are well. 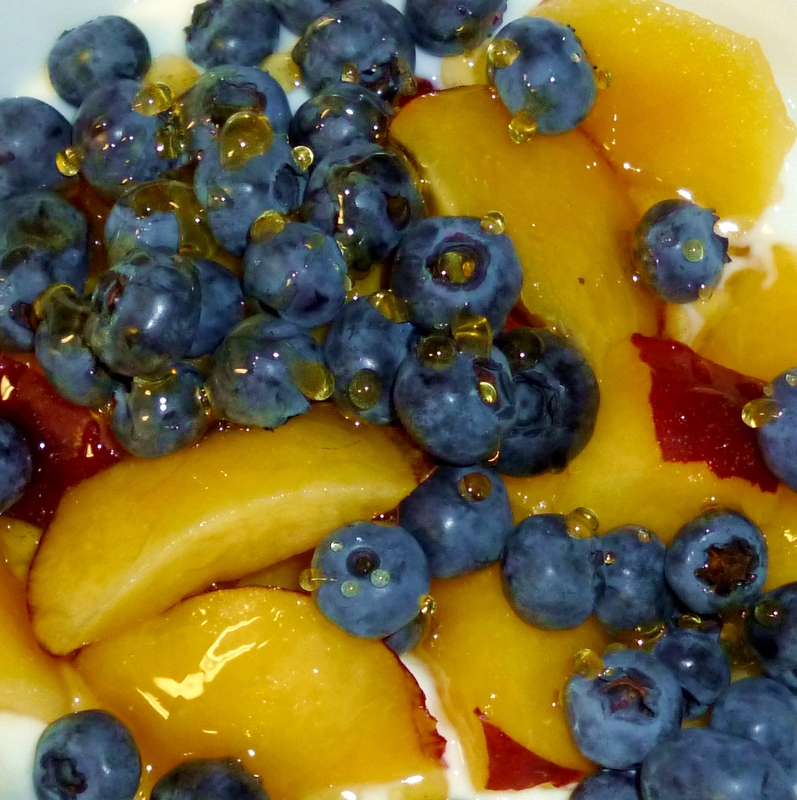 Blueberries have that cute little star on their bottoms… and are stars on the healthy=eating front, too! Native Americans knew how to pick the winners! will you be open Monday July 4, 2016? Well, the reason I couldn’t find where to sign up for pricing info may be ’cause I’m getting too old, so, I am giving you my email address here. Hi there! 2017 prices will the same as last year! Yay! $1.85 per lb for u-pick and $3.00 per lb pre-picked for 10 lbs minimum. We’re tentatively set to open July 1st. See you then! Great experience picking your wonderful blueberries. We hope to see your farm this coming season . Your blueberries are awesome!